All these examples have been created using Touch Develop. These can be used as a starting point for when students begin to design their own apps. Click here to play the game and view the code. Another example of what you can create using Touch Develop. 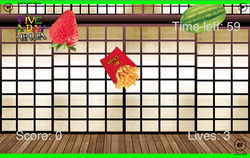 A fruit slicer game created using Touch Develop. A classic pong clone created with touch develop. A Break-Out clone created using TouchDevelop. A 3D animated dice created using touch develop. Click here to play and view the code.